You and your friends can always subscribe individually through the form on My English Club If anybody mentions to you that they are interested in receiving it, please tell them this, with thanks. Also, they can read the previous issues on Back Issues for English Corner E-zine. Of course, you can also unsubscribe at any point, by using the link at the end of any issue of the e-zine, should you wish. In addition, we had the course in reading, which we finished in March 2015. 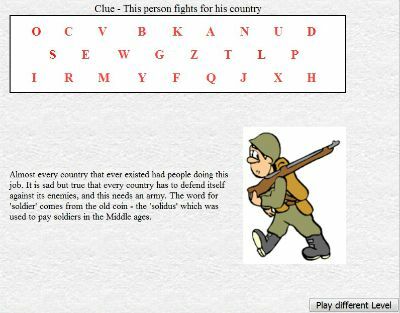 Following some requests at that time, we started a section on educational games, to add the fun into your learning. As we finally finished the course in website design in the last week of August, we have replaced it with our new course in writing, which I hope will appeal to everybody, from beginners to advanced speakers of English, more precisely to those who want to master the skill of writing in English. Today we continue our lessons on comparison by considering a few more complex cases, some of which you may or you may not have come across so far. You can find this lesson on the Special cases of comparison page. I do hope you find this useful and by next time I shall prepare some exercises for you to practice this matter. Last time we talked about what can be learned only from books, such as vocabulary and meaning, as well as grammar. For today, let's look at what can be learned only by doing, only by putting pen to paper and working those words into something that is uniquely yours. By applying the words in your own context, by giving them your emotions and putting this across to the reader, you ultimately learn to assimilate those words and their message as a part of yourself. It is actually your mind and heart that you share with the reader via the media of either your paper, book, the internet or the lyrics of a song that you're writing. Using the words and the meanings you've come to learn from books and other sources, it is only by working and by practising the art long enough and regularly that you will get to the stage of developing your ear in the sense of actually hearing where the power of the word lies. You will get to hear your voice. What is this 'writer's voice'? It is simply your own individual use of the language, which allows you to come to the material which only you can express. Only you have the feeling inspired by a particular thing, event or another person and only you can put this feeling across to the reader - nobody else can, since nobody else has this exact feeling. By getting inside the words and expressions you put onto the paper, by 'living' them as such, you will get to a stage when you feel them and they convince you and that's when you will actually convince another reader with your message. Ultimately it's not so much about what you say, but more about how you say it and this is the hallmark of the accomplished writer and his and her unique authority. This is useful not only to professional writers, but also to students trying to reach a stage in their language development and the more they master the art of writing, the more convincing they will be in their essays and exam pieces. This is a funny game today, with its easy, intermediate and difficult levels as such. I've selected the Job Hunter Game for today. Choose your level to start. 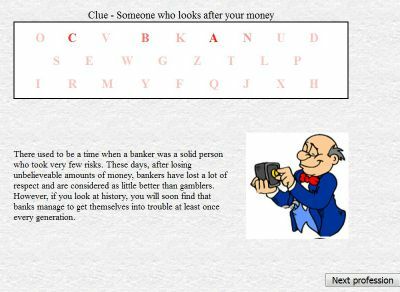 You will be given a clue on each screen, above a box with all the letters of the alphabet, from which you will click on the ones you think that make up the profession you think you're searching for, according to the clue. 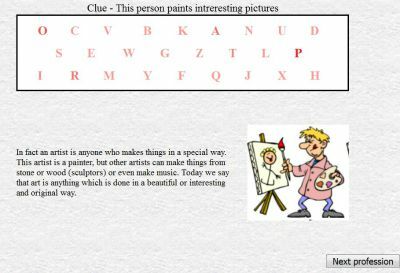 In this case I thought the profession would be a 'painter', but the system did not accept these letters, so I figured it was an 'artist'. 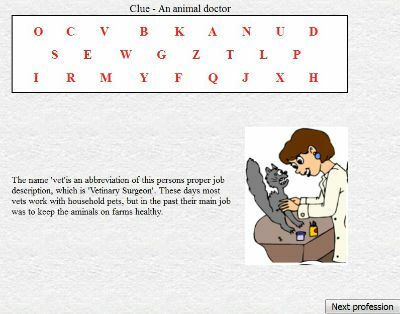 Once you get the right letters, by clicking onto each one individually the picture showing the relevant profession will keep revealing until you get the full picture and a description of the job in question. So, that's it - quite straightforward, right? At the end of a set of 10 choices, you get the option to change your level. You get no points for this, there is no timing involved - it's just a simple check on your vocabulary about jobs and professions in English. You can learn more descriptive vocabulary from the captions about the particular jobs you're unveiling in the process. That's it, your turn now - go ahead and play the Job Hunter Game . Show it to your children, play it together, practise and have fun! This is it for now, my friends! Please feel free to comment and suggest your ideas by replying to this email - I look forward to hearing from you. If you wish to chat either with me or with other members worldwide, go to My English Club .